Optoma HD66 DLP Projector. Condition Used but perfect working xondition. No remote control but comes with HDMI cable and power cable. Shipped with USPS Priority Mail. Optoma HD142X Home Theater Projector. Condition is Used. Shipped with UPS Ground. Optoma HD23 1080p Projector. Used for two years still works perfectly! Comes with everything pictured. Watch movies on a large screen with this Optoma projector. This Optoma projector's 15,000-hour lamp life ensures efficient performance, and its 3.5mm audio output lets you connect to external speakers for enhanced sound. Model: HD29DARBEE. Power Optoma’s optional WHD200 Wireless HDMI System with onboard USB power. Next Generation DarbeeVision Image Processor enhances images to reveal extraordinary levels of detail, depth, lighting, and object separation. Low hours. NTSC, PAL and HDTV compatible. Wireless remote; keystone correction; composite YPbPr, VGA and S-video connectors. Includes multi-lingual user manual. Keep in mind this a projector and has no sound outputs. Good shape Video projector New bulb. HDMI input doesn't work. 0.62" DLP (1). Used projector. Projector Size Old lamp included in bundle. Lamp Life Lamp Type Zoom Lens Lens Focus. 986h of 2000h used of Full power lamp life. Has a few scuffs and scratches on the case that do not affect the functionality. 0.55" DLP (1). Projector Size Native Aspect Ratio User Manual. " diagonal screen, place the projector lens between 9'-1" and 9'-12" from the screen. 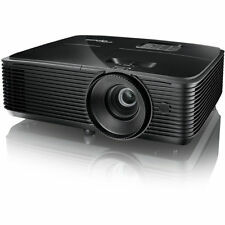 Optoma HD70 DLP Projector Brand New.. Condition is New. Shipped with USPS Priority Mail. Projector used for two years - No issues! Great picture quality. Comprehensive connectivity to satisfy your current and future needs. Optoma HD27HDR 1080p Home Cinema Projector in Box - Ships FREE! 1080p (1920 x 1080) native resolution. Including 480p, 720p, 1080i, 1080p, 480i, 576i and 576p for a wide range of compatibility options. HDR technology expands the contrast and color range of the pixels on your projector to reveal a better, brighter, more colorful image. OPTOMA HD8000 FULL HD 1080p DLP PROJECTOR! 1.0" DLP (1). Projector Size Lens Shift Zoom Lens Lens Focus Color Wheel Throw Ratio 21.0" - 282.0". 5 out of 5 stars - OPTOMA HD8000 FULL HD 1080p DLP PROJECTOR! 2 product ratings2 product ratings - OPTOMA HD8000 FULL HD 1080p DLP PROJECTOR! Optoma HD25e DLP Projector. Condition is New. Shipped with USPS Priority Mail. Box has been opened, just to inspect contents. Condition is Used. - Projector screen pulls up and down & is ready to use (missing right rubber end piece, does not affect performance). - 1080i & 720p. 16:9 aspect ratio. Optoma HD39Darbee 1080p 3500 Lumens 3D DLP Home Theater Projector New!!! Vertical Lens Shift and 1.6x zoom provide an intuitive and flexible installation. Adjust the zoom lever on the top of the projector. 5 out of 5 stars - Optoma HD39Darbee 1080p 3500 Lumens 3D DLP Home Theater Projector New!!! 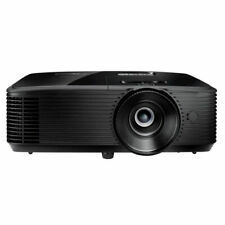 2 product ratings2 product ratings - Optoma HD39Darbee 1080p 3500 Lumens 3D DLP Home Theater Projector New!!! Reference display mode enables accurate REC.709 color. Caution-do not use the projector in places where flammable gases or explosives gases may be present in the atmosphere. Aspect ratio is 16:9 native, 16:10 and 4:3 compatible. Optoma HD23 Full HD Home Cinema 1080p Projector . Condition is Used, adult owned and in excellent and super clean condition. Bulb is original factory bulb and has 1724 hours at this time. Comes complete with lens cover, remote, power cord, instruction disk, and original box. Projector works perfect. I have decided to upgrade but this is a great projector. I have always projected this onto a light gray painted wall and the display is great. No screen needed if you have a white or gray wall. Shipped with USPS Priority Mail. Embrace HDR Technology and large screen technology with the Optoma HD26HDR! Brighter whites and deeper black levels are presented with vivid colors for an unmatched experience. Support for 144Hz rapid-refresh rate provides ultra-smooth flicker-free images. Works great, looks like new. No cables included. 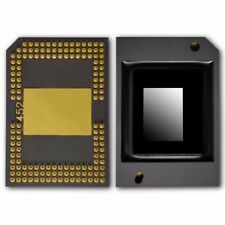 OPTOMA FACTORY RECERTIFIED HD39DARBEE N:1920X1080-FHD/M:1920X1200-WUXGA 32K:1-CO. Mfr Part #: HD39DARBEERFBA. Check-Out Now! It provides easy and convenient connection: 2 HDMI inputs with MHL support and built-in 10W speaker. With Darbee Visual Presence technology, the image reaches an unprecedented level of realism. MPN HD29DARBEE. Amaze your friends with fantastic image detail and superior color reproduction. HD141X Projector. How's the HD141X better than its predecessor, the HD131Xe?. Support for 144Hz rapid refresh rate provides ultra-smooth flicker free images. The Optoma UHD60 also features vertical lens shift and a 1.6X zoom for easy installation. Optoma UHD60. With a TV, you need to sit 5-6 feet away for the optimum picture quality – most sit further away. Optoma EH7700 Full HD 1080p WUXGA Large Venue Theater Projector - 7500 Lumens! Up for sale: Optoma EH7700 projector. 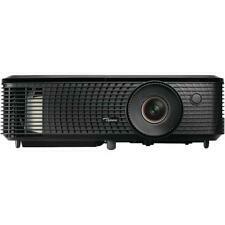 Notes: Native full HD WUXGA 1080p large venue projector in perfect new condition. This is a very bright high-end projector. Ultra-short throw fixed lens 0.8:1. Short throw zoom lens 1.2-1.5:1. Its brightness and 20,000:1 contrast ratio produces incredibly sharp and vivid images, even with moderate room light. Support for sRGB and REC.709 color profiles ensures accurate color reproduction whether the source is PC, Mac or video devices. I have a used Optoma DLP projector that works perfectly. Don't waste your money on anything less! > 3D modes: Full HD 3D. > Native aspect ratio: 16:9 (HD). > Contrast: 10,000:1 ! Product Model #: HD39DARBEE. The integrated. Product Model # HD39DARBEE. HD39DARBEE DLP Projector. Product Model: HD39DARBEE. Manufacturer Part Number: HD39DARBEE. Native Resolution: 1920 x 1080. Manufacturer: Optoma Technology. Condition is New in original box with remote. Great quality! Contrast Ratio: 23,000:1; Keystone Correction: Yes, Lens Shift: No. 2 x HDMI (1.4a 3D support) MHL v1.2, Audio Out 3.5mm, 12V trigger, 3D-Sync, USB service. Mfr Part #: HD143X. The vivid colors, deep black levels and crisp details make it a must-have for watching Hollywood blockbusters and gaming. A pair of HDMI inputs and USB power provides easy connectivity to the latest HD video streaming devices and gaming consoles to the Optoma HD143X. MFG Part #: GT5600. Full HD 1920 x 1080 Native Resolution. The manufacturer will generally repair or replace the item so long as it is under warranty. How long does it generally take to process an order?. Vertical Lens Shift and 1.6x zoom provide an intuitive and flexible installation. Adjust the zoom lever on the top of the projector. High performance and low maintenance with 15,000 hours of lamp life in Dynamic mode.Light Source Type:240W. Resolution Native 1080p (1920x1080). Vertical Refresh Rate 24 to 85 Hz. Computer Compatibility HD, UXGA, WXGA, SXGA , SXGA, XGA, SVGA, VGA Resized, VESA, PC and Macintosh Compatible. Projection Lens F= 2.55-2.87, f= 22.4–26.8mm, 1.2x Manual Zoom and Focus. What's included: 1 Projector, 1 Power Cord. Good used working condition (0 Lamp Hrs). Included power cord only. Its 1.1x zoom, sRGB support and 25,000:1 contrast ratio makes it perfect for watching TV shows, sports, movies and gaming. Video and photography enthusiasts can use the sRGB color space to produce rich, accurate color based on the primaries of REC.709b HDTV specification when used with any sRGB-compatible device, including both PCs and Macs.